The seven young victims of Tuesday's fire were remembered at a Halifax service that was opened to the media and the wider community. Seven white caskets were met by thousands of mourners in Halifax Saturday afternoon as the community gathered to say goodbye to the Barho children. 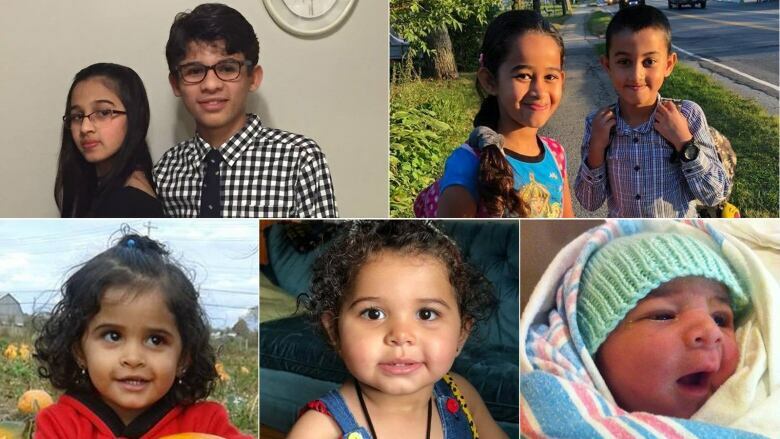 The Barho children — three-month-old Abdullah; Rana, 2; Hala, 3; Ola, 8; Mohamad, 9; Rola, 12; and Ahmed, 14 — died Tuesday morning after a fire swept through their home. 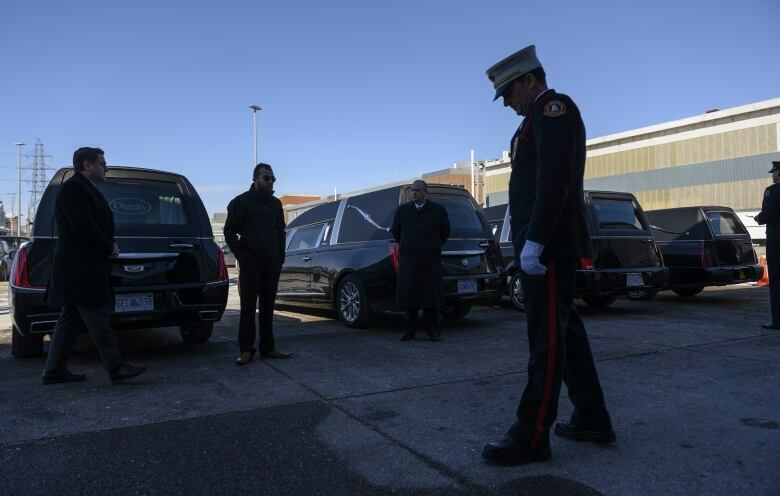 "This is not a typical funeral, it's a children's funeral," said Ahmad Hussein, a board member of the Ummah Mosque — the mosque attended by the Barho family, said during the funeral at the Cunard Centre. Hussein said the decision to make the funeral public came after seeing so much support and compassion for the Barho family from the community. "It wasn't just the Muslim community suffering, it was all Haligonians, everyone in Nova Scotia was suffering and everyone in Canada was also suffering," Hussein said. There were 1,800 chairs and all were filled. An estimated 1,000 people stood for the whole funeral, which was more than an hour. The service was in both English and Arabic. "Today, we feel the pain of losing these children. And for many people here, we feel the pain as if it were their own children," said Sheikh Abdallah Yousri. "The pain and grief that we are feeling is very deep and very genuine. And all our hearts and prayers are for the children and for their father Ebraheim and their mother Kawthar." The Barho family arrived in Nova Scotia in September 2017 as refugees from the war in Syria. The group that sponsored them, the Hants East Assisting Refugee Team Society (HEART), spoke at the funeral to thank all the people who helped the Barhos after the fire. "On what is our darkest day, we see the best of humanity when we look out into the sea of faces in front of us," said Natalie Horne, a member of HEART. Horne said HEART was grateful to the Barho family for including the organization in their lives for the last 16 months. "Our lives were enriched as a result of our relationship with you and your children. We loved them and we love you," Horne said. "And even though we are no replacement for family that is overseas, we are so happy that you welcomed us as part of your Canadian family." Nova Scotia's lieutenant governor, Arthur J. Leblanc, said what happened to the Barho family was "an almost unimaginable tragedy." "Like any family that comes from a war-ravaged country, they had hopes and dreams for a new life in Canada. And that dream has been shattered," Leblanc said. Nova Scotia's deputy premier, Karen Casey, said the province will continue to support the family. "We will not abandon you, we will not leave you, we will travel this journey with you. Please accept our love, please feel our warm embrace," Casey said. Andy Fillmore, MP for Halifax, said the federal government is continuing its work to bring relatives of the family to Canada "as quickly as possible so they can be by your side." Halifax's deputy mayor, Tony Mancini, said he was "inspired by the way our neighbours have come together" to help the Barho family. "I'd encourage each of you to use the sadness we share as a community to fuel acts of love and kindness toward our family, friends and neighbours," Mancini said. Sheikh Hamza Mangera, imam at Ummah Mosque, told the mourners that the children's lives teach us how each day is precious. "Life is so short, there isn't enough time to love. I don't know where people find time to hate," he said in English. 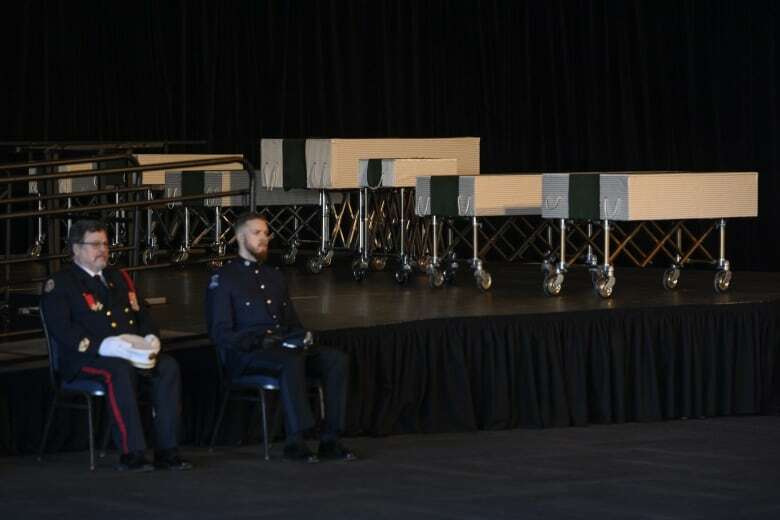 The funeral ended with a prayer and all seven caskets being wheeled out of the Cunard Centre. Rukiya Ali was one of hundreds of people who attended the funeral. She said she lost two of her own children suddenly — one was 12 and the other was 30. "Everyone is sad, everyone is mourning these people. I've never, since I was born, seen something like this. Seven children at once? It was a heart attack for me," Ali said. Gail Arnold said the funeral was "absolutely beautiful," adding it made her feel proud to be Canadian. Arnold said she came to show support to the Muslim families throughout Canada and to show she cares about immigrant families. She said her thoughts are with the parents. "I don't know how that poor mother or father are going to get through this. Those beautiful children, such a loss," she said. Margaret MacDonald tutors English through the Immigrant Services Association of Nova Scotia (ISANS). MacDonald said her church sponsored a family a year and a half ago: a mother and father with two children. She said the family she helped sponsor was friends with the Barho family. "These beautiful children have added such light and love to our lives too and it's a great loss for everyone," MacDonald said. All were welcome to attend the funeral, which included an introduction and prayers for the Barho children and their parents, said Yousri ahead of the funeral. "In our traditions, we don't break the sorrow at the funeral. We don't joke, we don't laugh — we do it as a kind of respect," said Yousri. After the burial and a vigil, Yousri said the sorrow is broken to recall joyful memories with the children. Ebraheim, the children's father, remained in a medically induced coma in hospital on Friday. He was severely injured after going back into the burning home to try to save the children. 2,800 people attended the funeral for the Barho children, according to a count from the facility manager. An earlier version of this story had an incorrect estimate and has been updated.